Alfa Romeo's brand-new Giulietta will be inaugurated in Hungary with a special show during the official Hungarian Alfa Romeo centenary festival, Alfacity, which is set to take place at Fort Monostor, Komárom, in three weeks time. The annual AlfaCity event organised by Alfa Amore is one of the most eagerly awaited Alfa Romeo events and sees the involvement of hundreds of Alfa Romeos and thousands of participants. Alfa Romeo's brand-new Giulietta will be inaugurated in Hungary with a special show during the official Hungarian Alfa Romeo centenary festival, Alfacity, which is set to take place at Fort Monostor, Komárom, in three weeks time (Saturday, May 29). Approximately one thousand cars and five thousand participants are expected to attend the largest Alfa Romeo jamboree in Central Europe. Large exhibitions of old-timer and modern cars, a beauty contest, and a Back II Black concert are scheduled. The annual AlfaCity event, organised by Alfa Amore, is one of the most eagerly awaited of Alfa Romeo enthusiasts' events and sees the involvement of hundreds of Alfa Romeos and thousands of participants. A quarter of the visitors usually arrive from abroad, mainly from Hungary's neighbouring countries (Croatia, Slovakia, Romania and Serbia) nevertheless Alfa Romeo owners have travelled from as far as Poland and Germany. They are mostly members of Alfa Amore, the online community of Alfa Romeo owners. 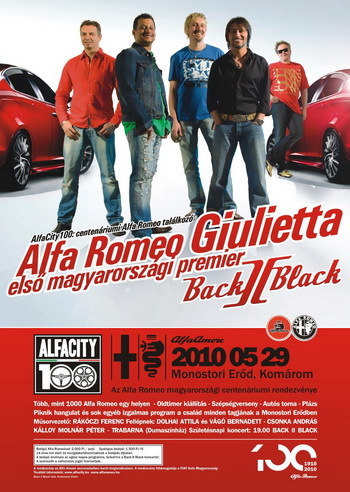 This year's event will be all the more extraordinary because it falls on the centenary of Alfa Romeo and because of this momentous occasion festivals are being organised all around the world; and in Hungary AlfaCity 100 is playing an official role. 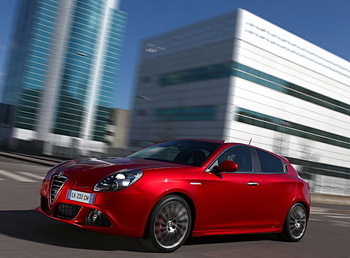 The highlight of the event will the Hungarian première of the Giulietta, the brand-new C-segment model from Alfa Romeo, and it will be the first opportunity for Hungarian Alfa Romeo fans, journalists and other interested onlookers to become acquainted with this car. The festival will start at 9am and the day's programs will run continuously from 11am. On the stage, stand-up comedy will be performed by comedian Trabarna. Host of the day's events is set to be radio-anchorman Ferenc Rákóczi, however famous Alfa Romeo owners' will also appear, such as popular actors Péter Kálloy-Molnár and András Csonka. The highlight of the day, the inauguration of Giulietta, will start at 2.30 pm, Back II Black will give a concert at 7.00 pm, and later on in the night a deejay will tune up. It will be possible for visitors to Alfacity 100 to vote for the most beautiful car of the festival, with a highlight being on the Alfa 75 sedan which is celebrating its silver jubilee this year. On the concrete, a tyre-smoking and a car-handling competition is going to be organised, moreover with the event respecting International Children’s Day little Alfa-fans should have fun, too. Visitors will also be able to watch a short film about Alfa Romeo’s past hundred years along with live classic music.